A brainstorm rewarded us with a great new idea for the garden: a “perch,” built into the slope behind the house, overlooking the grape arbor, the studio, and of course the valley. Besides many heavy stones, we needed some gravel. 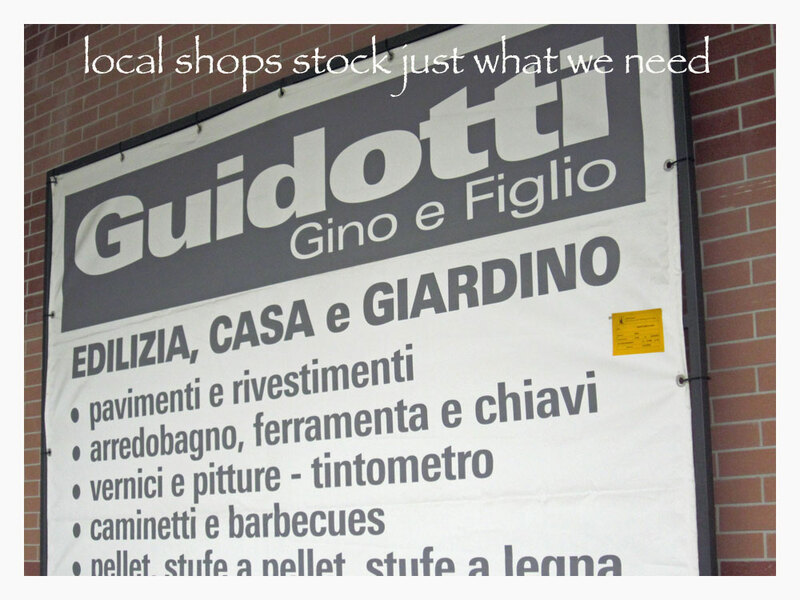 So, we went to one of our favorite ferramente, hardware stores, Guidotti in Pontassieve. Since we hadn’t been there for a while, we were glad to see our old friends Roberto and Francesco, who had been so helpful in the past with a number of knotty problems. They informed us that the gravel yard had closed promptly at noon, so we’d have to return at 13:30. In the meantime, they suggested a rosticceria, a roasting restaurant in Sieci, where we could eat. Nice idea! On our way to lunch we swung by a small hardware store to buy some bags for the gravel, since Guidotti didn’t have any. Unfortunately, most Italian stores usually don’t have prepackaged bags of mulch, gravel, sand and stuff like that as we’re accustomed to in the States. Only giant piles of stuff. To our surprise, the hardware store had been replaced with a daycare center! Odd conversion, we thought. We circled the block to drive by Moncini Auto to ask our car dealer friend Angelo what had happened to the place. He said they moved down the street and around the corner about 3 years ago. Oops . . . time really flies! 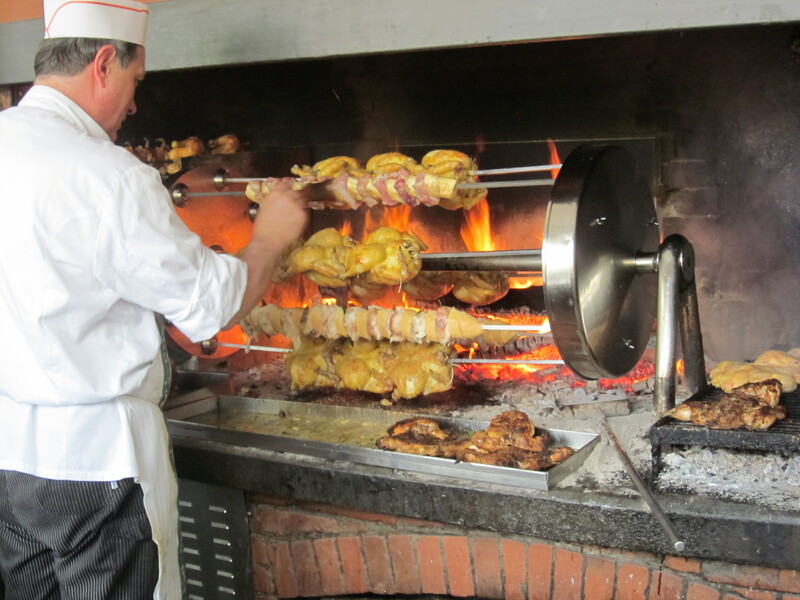 At their new location, the hardware store had some good sturdy bags for totin’ gravel, so we bought 4 for a total of 2 euro and headed on to lunch.The recommendation from Guidotti was perfect and we enjoyed some good spit-roasted chicken. It was delicious! After lunch, we decided to use our last few minutes checking out the ancient church in town. We enjoyed the millennium-old masterpiece with its beautiful bell tower. Then, a bonus winding walk through the narrow medieval passageway down to the river where we discovered a delightful walkway along the Fiume Arno, complete with picnic tables. We made a mental note: Our next visit would certainly include roast chicken take-out to be enjoyed at a shady table, peacefully situated along the grassy river banks. For sure! Back to Guidotti. Perfect timing since the iron gates just opened. They sent us from the storefront on a driving expedition through the twisting, cluttered materials yard out back. The locked gate at the end of the drive, signaled that someone would soon arrive to get the gravel for us. Sure enough—he came sauntering around the corner, just waiting with time on his hands to shovel ample amounts (thankfully not too much) into each giant bag. 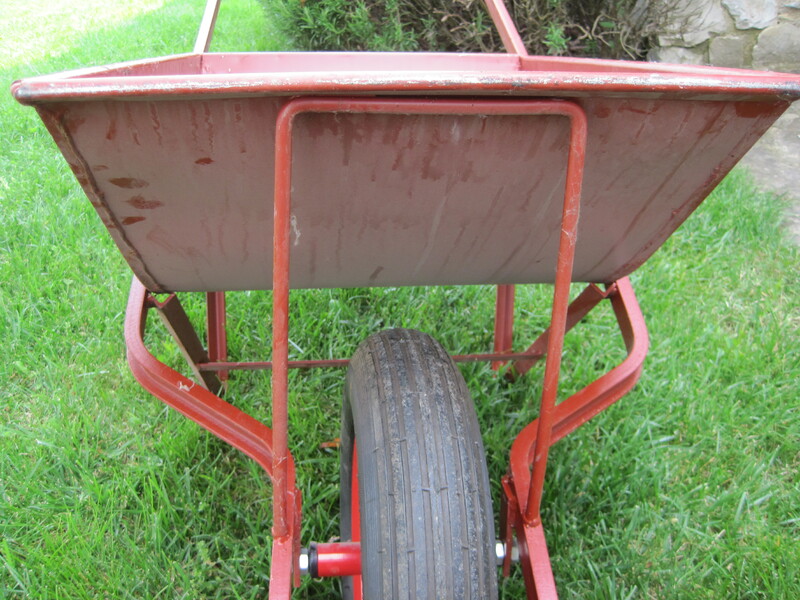 We were ready to head back to the garden when the idea of a carriola, wheelbarrow popped into our heads. We agreed that this may be the time to spring for one of those back-saving devices. After all we are anziani, old folks, by Italian standards. Sure enough, our shovelin’ buddy was the man to help us with that request as well, so we drove behind him as he meandered to a remote corner of the yard. At a rusted shed that looked like it hadn’t been opened in 20 years, he unlocked the big iron door. (Italians seems to delight in having things secured under lock and key.) There against the back wall was a fleet of authentic Italian wheelbarrows. Now, these weren’t just any wheelbarrows—they were Muratori Carriole, Stone Masons’ wheelbarrows. This was the real McCoy (or the real Guidotti, in this case). There was nothing flashy or modern about them. They were hand-made from flat sheet metal and angle iron in the traditional style. They had big air-filled tires that had long since gone flat, and they were covered with dust, dirt and cobwebs. PERFETTO!! We simply had to have one. Our day clearly etched itself into our memories—another one of those “Italian Moments,” as we like to call them. That’s when time and events unfold in surprisingly slow and unpredictable ways. One thing leads to another, and before you know it, you’re swept away in a timeless scenario of people and places that could only happen that particular way in sweet Italia. We love the down-home magic of those special moments. 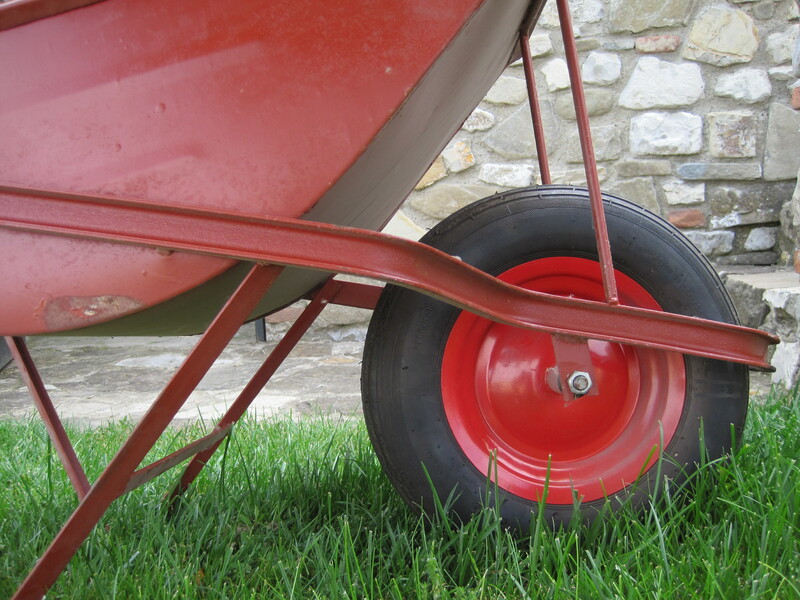 The dusty red wheelbarrow now holds a prominent place in our cantina, storage area where memories can come rolling out at any time. That combination of the squeaky wheel, the horsey angle-iron and the rustoleum paint “hauls” magic when and where we least expect it. 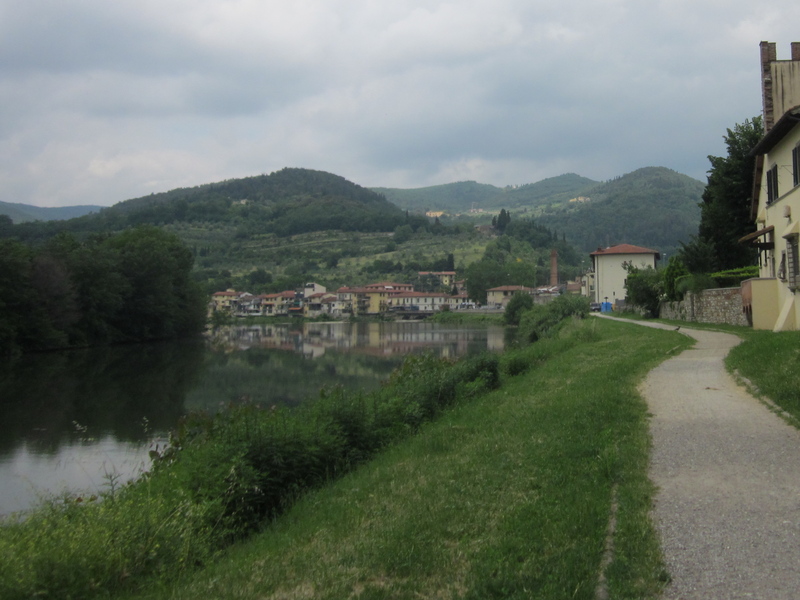 A true “Italian Moment,” is worth savoring—like hot roasted chicken along the banks of the Arno!